Mardi Gras is French for “Fat Tuesday” which is the last day Roman Catholics and many other Christians can let their hair down and eat, drink and be merry before the 40 days of fasting and prayer of Lent commence with Ash Wednesday. At Dreams Resorts & Spas, we go to great lengths to celebrate this holiday, and do our best to incorporate many activities for the entire family to enjoy. Along with the elaborate costumes, colorful masks and exciting parades, another part of the celebration of Mardi Gras is the traditional oval cake in honor of the three kings – the King Cake. The shape symbolizes the unity of faiths. Each cake is frosted and decorated with colored sugars (purple, representing justice; green, representing faith; and gold, representing power. A small baby, symbolizing baby Jesus, is baked into each cake and the person who find it is made ‘king or ‘queen’ for the day. The traditional King Cake is made from twisted strands of cinnamon dough, topped with icing, and sprinkled with purple, green, and gold colored sugar. 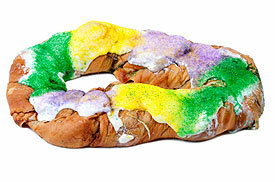 See below for a quick and easy recipe if you’d like to create a King Cake of your own to enjoy at home. It’s the perfect family-friendly way to celebrate Mardi Gras with the whole family! Separate the cinnamon rolls and roll them out by hand so that they look like a hot dog. Shape the roll into an oval, pinch the ends together, and place on a cookie sheet. Cook as directed. When they are finished cooking, ice the tops with the white icing. Sprinkle the different colors of sugars alternating as you go around the oval. This entry was posted in Dreams Resorts & Spas and tagged family activity, Fat Tuesday, holiday, King Cake, Mardi Gras, Mardi Gras Parade, Mardi Gras tradition, recipe, Resort Entertainment. Bookmark the permalink. LOVE IT! And its an EASY PEASY Recipe too! Love that you are always making SWEET DREAMS nice to see you share SWEET TREATS! YUM!